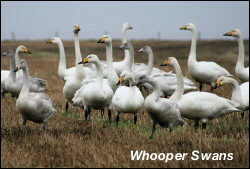 At long last we were able to film a large gathering of Whooper Swans resting and feeding in a stubble field. It was interesting to watch some of the young feeding whilst sat on the ground – their flight from Iceland had exhausted them so much they could not stand up! In the two weeks we searched for Otters on five days and saw one on each of four days which is the best ‘hit’ rate we have ever had. The largest group of Fieldfares that we encountered was thirty and these were feeding not on berries but on fallen apples in an orchard. As we drove home on Saturday we received a call on the mobile, from the owner of a garden on Islay where we had been filming, to inform us that six Waxwings were now feeding there – my favourite bird, missed by only hours – you can’t win them all! !